Baby will soon learn to love the water and be swimming like a fish! 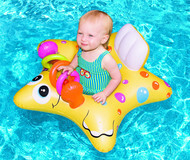 Cute and friendly Starfish baby seat with on board toys. Everyone loves a clownfish… Especially kids! Clownfish Baby Seat is complete with dual safety chamber design. Friendly airplane style baby seat with overhead sunshade to. Stable, multi chamber design. Swan Baby Seat is complete with dual safety chamber design. 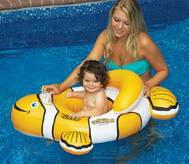 Soft and cuddly ducky style baby seat with heavy duty inflatable inner tube and "tail" seat back. Fabric cover stays cool and comfy. Squeeze the duck's beak to hear him quack!